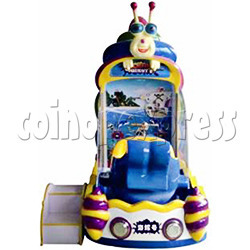 Ocean Quest Kidde Ride Water Shooter Ticket Redemption Game is a funny game which perfect combination of children kide ride game and water shooting game, design for children at younger ages. Machine appearance design with gorgeous color conch shape, and the seat design with the cartoon dolphin-shape, loved by the children. Player shooting the target of light up by the water gun, shoot as many targets as player can to get more scores. At the same time, the dolphin seat swings from side to side, experience exciting and fun game trip. Player insert the coins start the game, the dolphin seat began to swing, and the water gun shooting the water, player control the water gun to shooting the targets that light up to win the scores. The more player hit the target in the game time, the more scores player get, when the game time is over, machine according to the scores exit the tickets.